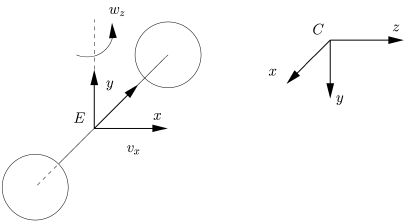 Generic functions for Pioneer mobile robots. This class provides common features for Pioneer mobile robots. This robot has two control velocities , the translational and rotational velocities of the mobile platform respectively. The figure below shows the position of the frames that are used to model the robot. The end effector frame is here located at the middle point between the two wheels. Definition at line 91 of file vpPioneer.h. Create a default Pioneer robot. Definition at line 97 of file vpPioneer.h. Definition at line 106 of file vpPioneer.h. References vpRxyzVector::buildFrom(), vpMath::rad(), vpTranslationVector::set(), vpUnicycle::set_cMe(), and vpUnicycle::set_eJe(). Referenced by vpPioneer(), vpPioneerPan::vpPioneerPan(), and ~vpPioneer().